GISTEMP -vs- HadCRUT | Wott's Up With That? “GISTEMP -vs- HadCRUT“. Steven Goddard continues his voyage of discovery. Gosh, the GISTEMP data-set uses a somewhat different Arctic data than HadCRUT3 and has a different interpolation process! Gosh, the GISTEMP trend is rising faster than the HadCRUT3 trend! Gosh, GISTEMP is a lying trick! Gosh, maybe there has been an amplified response to Global Warming in the Arctic? More nit-picking idiocy from Steven, who can barely recognize his own hand in front of his face. This entry was posted in Anti-Science, Half of the Story and tagged Numbers are Tricky by Ben. Bookmark the permalink. So, one more time: Arctic temperature anomalies in GISS are extended from shore station readings. In HadCRUT it is, in effect, the hemispheric mean temperature anomaly. So GISS’s anomalies continue to trend above HadCRUT’s. OK, let us imagine that you had predicted that a key climate metric, say arctic ice extent, would ‘continue to recover’ over the year, but a few weeks after you make this forecast, the observed value actually plummets more than two standard deviations…. 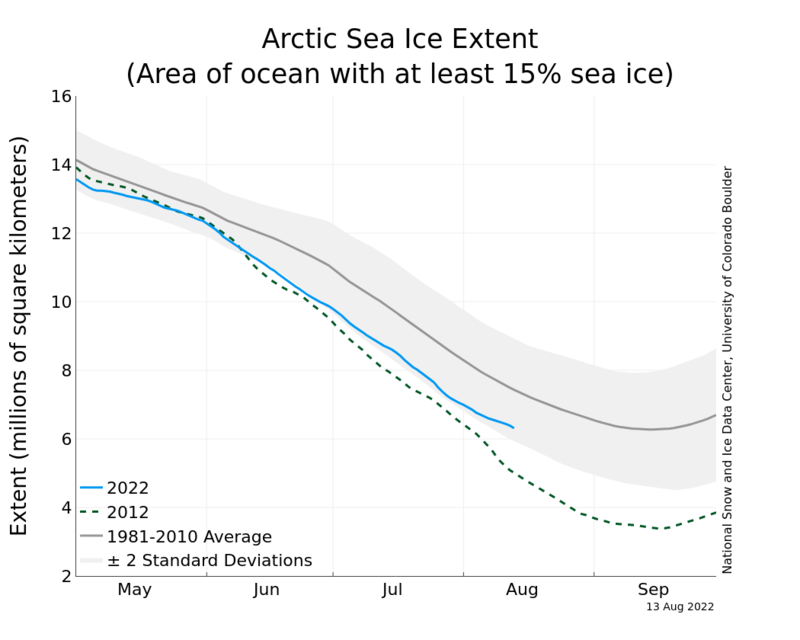 Despite strong growth of new ice over the winter, sea ice is still in a general state of decline. 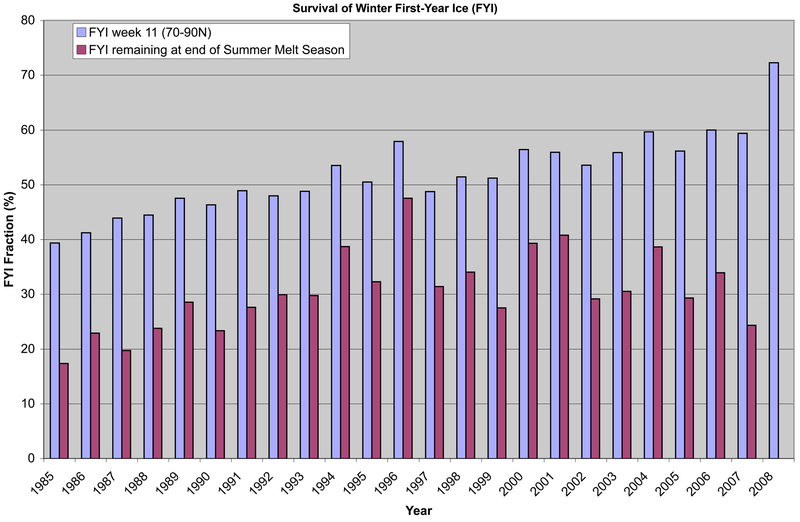 The ice that grew over the past winter is relatively thin, first-year ice that is susceptible to melting away during the summer. In fact over 70% was first year ice (FYI) here’s the graph. So the thin ice of Spring 2008 gives us our low volume starting point. Excellent. 2. Publish percentages, not absolute values. Analyse the percentage of ice of various thicknesses now and then, ignoring the fact that the ice has shrunk in extent since May 2008. Its only about 3% but every little helps. It’s not like we’re doing science here. 3. Devise a novel methodology. Fortunately there are no long term observations of ice volume/thickness. What we do have is the US Navy Polar Ice Prediction model PIPS 2.0 (superceded by v3.0 in 2005 but that is classified, presuambly its sufficiently accurate to assist an enemy…). PIPS 2.0 gives us a colour coded map of thickness for any given day. So we can reverse-engineer this by counting pixels of different colours and devise a nonsense algorithm to get to volume. The advantage being that nobody reading the blog is likely to go to similar lengths to check our figures or choose different dates…. Which we can quote any time the inconvenient decline in extent comes up. Cool. Just hope nobody digs up the figures published by the University of Washington or reads the associated analysis Total Arctic Ice Volume for March 2010 is 20,300 km^3, the lowest over the 1979-2009 period and 38% below the 1979 maximum.